To increase the amount of produce from the perennial vegetables already under cultivation – essentially by having more plants. To extend the area under cultivation – in the Borderland garden. To try some new crops – mainly different varieties of peas and beans, plus some grain and seed crops. In the Borderland garden the new polyculture patch has been extended further using multiple layers of turf (removed from lawn near the house) laid on top of hawthorn hedge trimmings. It has been sown with pea and bean seeds and will have some flowers sown or planted soon. I found last year that peas and beans grow well in upturned turf. I am not in a hurry and just want this area to have a chance to bed down, for the turfs to decompose whilst allowing nitrogen fixers and other beneficial plants to play their part in enriching the soil. 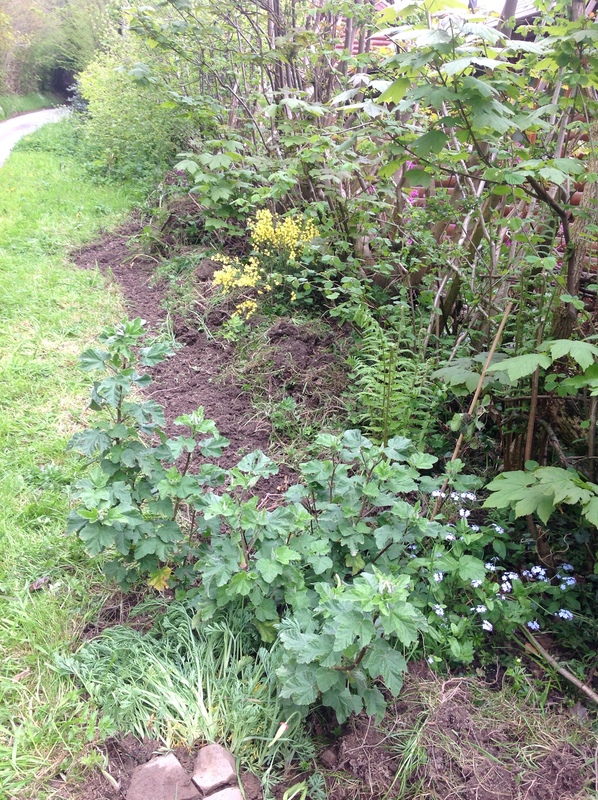 On the roadside along the boundary hedge I have taken up the rough grass and other plants to make a bit of a border. I turned the grass / plants upside down and put them under the hedge to decompose and planted oca, beans, peas and flowers in the new border. This soil here is already very deep, soft and it certainly appears fertile so I have not felt the need to allow it time to build fertility before planting. 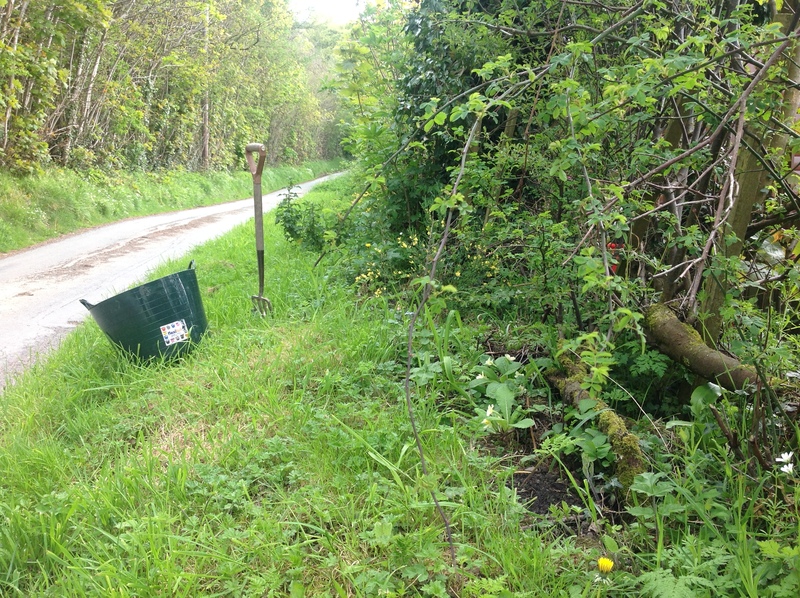 Earlier this year I planted this hedge edge with golden hop, jostaberries, blackcurrants and primroses (from the other garden) together with a small plum tree and day lilies (gifts) and a bought loganberry to join mallow, wild garlic, broom, wild flowers and a few other bits and pieces already in place. Beside the house where the lawn has been removed I am planning a conglomeration of flowering things. These will be for the benefit of bees and other insects, for visual delight and possibly with some edible bits as well. In the Telford garden I have planted out shallots, oca, yacon, potatoes. Corn and peas are sown, with beans and more peas to come later. Because of the house sale I am keeping it simple as I cannot be sure how long we will remain here. Although having said that there has been very little interest so far as unfortunately I live in an area that is being utterly swamped with new housing and it is proving harder for people to sell older properties so we could be here for a very long time to come. As far as trying new crops goes I would like to grow plants that provide as wide a range of nutrients as possible. Most vegetables are very watery in content and their nutritional value lies primarily in the vitamins, minerals and phytonutrients they encapsulate; although some roots, like potatoes, are carbohydrate rich. I want to grow more of my own carbohydrates, protein and oils which means more grains, peas, beans and seeds. So far I have put in a few sunflower seeds, but plan to plant as many sunflowers as possible in the next few weeks. Where I have removed some ‘weeds’ I have scattered flax seeds and plan to go round tomorrow scattering some more. It doesn’t look like there is much room for vegetables, but I just slot them in between the flowers (or take the flowers out if they are over or in the way). This entry was posted in Borderland Garden, Edible Perennial Gardening, Forest Gardening, Hedgerow, Perennial Vegetables, Polycultures, Telford Garden and tagged flax, grains, Oca, sunflowers, Yacon. Bookmark the permalink. Looks wonderful. I love the idea of planting by the hedge…do you think it will need lots of water? Just wondering as I’ve been making a bit of a border near an (admittedly very large) hedge and some things seem to struggle for water, but then again others are fine. They will be fine for water by this particular hedge with deep, humusy soil. There is another we inherited which is conifers and is very dry. If I wanted to plant by a dry hedge I would mound up LOTS of biomass, let it decompose and plant into it, keeping it topped up with all kinds of mulch to ensure high levels of humus. I try not to water anything at except in exceptional circumstances. Hi Anni, thanks for the posts – keep them coming! Just reading in your post about how you’re wanting to grow more protein in your garden. Have you considered growing oyster mushrooms? You can grow them on waste products like cardboard or coffee grounds, in the shadiest corner of your garden. When they’re finished you have nutritious, cholesterol-reducing vitamin rich 33% protein mushrooms and compost! Well, that’s the plan anyway. My friend spent autumn / winter wwooffing at a farm where they cultivate various mushroom varieties, and he kindly set me up with a king stropharia mushroom bed. I fancied trying out oyster mushrooms too, as he’d already experimented successfully with growing those on cardboard, so I put in a couple of beds this week. I might end up with a pile if mouldy cardboard, or I might get lucky. If you’re interested, I’ll let you know how it goes. I love the sound of your king strop hairs bed. I have coveted growing them since reading mycelium running a few years ago. Yes, I have considered oyster mushrooms and others for protein and that would be great. I did plan to experiment but not fitted it in yet, keep thinking every I must have a go. In the meantime peas and beans are a very easily grown source of proteins and some grains are high as well, so am just finding it a bit easier to organise myself to get these going. However I really must try the oysters as we have a lot of waste card etc one way and another and it would be great to turn it to food. Just wondering – what substrate is used for the king stropharias? A “conglomeration” of flowering things. I love it! Yes, I have heard about Camelina and got some seeds for this year. So far the plants have not appeared! This year, the rest of the seed packet for the giant-flowered variant still germinated well, but as I had started them earlier (mid April, I think) in the hopes of an earlier bloom and better pollination, and I only planned on planting them out now, after the Ice Saints, half of the seedlings have mysteriously gone limp and died. (Didn’t happen with any of my other annual flower seedlings, which were treated exactly the same.) And the short-stemmed F1 variant I wanted to try on the balcony this year (the fertilised normal sunflowers got well over 3 meters tall, the unfertilised ones still at least 2 meters), hardly germinated at all – like, 3 out of 10, even though the pack was new. (I didn’t want to use F1 seeds, because I almost always have this problem with them except for one old hybrid tomato that’s been in use in my area for decades. But I can’t find short-stemmed sunflower seeds that aren’t hybrids, at least not in local shops, and I don’t want to order online for logistical and financial reasons.) Also, beware of birds stealing the seeds out of the soil after you sowed them. Yes, they will find them even 3-4 cm down. That’s partly why put mine in indoors pots first this year. All in all, they’re nice to have because they bloom for a fairly long time, and are tall enough to loom over vegetable plants, so they don’t waste space. But it’s far too much energy / time input to grow them for the seeds. The walnut tree I mentioned earlier isn’t ideal for new plantings. They grow very fast, and very readily from nuts as I can tell every spring, but it still takes at least 20 years till you get a good crop, according to the literature. (They do give that crop for like 150 years, though. However, only a good one once every 4 years on average, and once every 4 years nothing at all, here in Germany, thanks to the aformentioned possibility of frost nights until mid May. They should in theory do better in the milder British climate. On the other hand, last year’s bumper crop came after a particularly long winter – almost continuous frost from New Year’s Eve till the end of March – so maybe the species needs a lot of cold days as well as not liking cold weather once it blooms. There are different variants that bloom weeks apart, though.) Also, the walnut tree throws a lot of shade once the leaves grow in (right about now), and once its grown, it’s going to shed a steady stream of twigs and small branches during storms (they are hollow and break easily) – which are nice for fireplace kindling, but too soft to be usable for anything else. And the leaves, wood and all other parts contain juglon, which is growth-inhibiting to most other plants, especially nightshades like tomatoes and potatoes, which is why it’s better to compost them in a seperate pile. (The compost also turns acidic like it would with oak or chestnut leaves, so it does pretty well for things like rhododendron, which in our garden has survived and thrived for decades even directly underneath the walnut tree.) I’ve read that the juglon will be destroyed after a year in the compost heap, and I have grown tomatoes in old compost that contained walnut leaves. But I wonder if they wouldn’t do better without. Hence the extra walnut-free compost I started last year and my annoying my mother by telling her exactly which heap of recycled potting soil she can use for her flowers, and which I’m saving for the vegetables. Apart from that, I’ve read that the walnut trees actually excrete the stuff from their roots to give themselves a competitive advantage, which for example apple trees don’t like at all. We’ve got an old apple tree that’s doing reasonably well for its age, but that’s about 10 meters away from the walnut tree. Plums apparently survive a bit closer. By the way, be careful with those columbines (in the last photo). Yes, they’re pretty and awesome “sow once and forget them” flowers that are one of the few species that will grow well in the shade. But, as I found out this year after establishing them a couple of years ago: If you don’t decimate them before they self-seed, they will completely take over an area that they like. I have a patch of them now that killed the corydalis growing abundantly there before, and this year they even managed to shade out the tulips and daffodils also growing in the same bed. You’d think the early spring bulbs would grow faster, but they didn’t get to form more than a few leaves, before the columbines came up and drowned them. The tulips didn’t even form any flowerstalks, nevermind bloom, and the daffodils only showed 3 small flowers on the edges of the patch, out of a dozen planted. 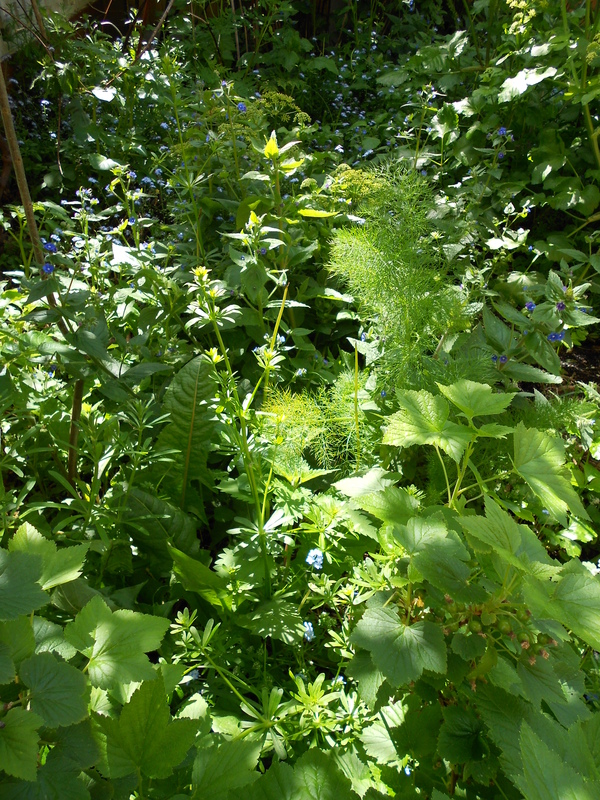 Not sure about which plant you identified as dill – perhaps it was the fennel growing with the blackcurrants in the second picture above. It would be nice if there was a perennial dill, but sadly I don’t have it! I have hazel in the hedge. So far I have left the nuts for the squirrels but I may make more effort this autumn and scramble about in the undergrowth to retrieve them myself. Walnuts are out of the question for my garden, if I had the space for a tree of that size I’d choose a different nut anyway! Happily my columbines don’t get out of hand. They have been in the garden just about for ever, certainly before I moved in with my partner (14 years). I do aim to cut off the seed heads each year, but didn’t do so last year. However they have not had space to seed around, as the ground is already full with plants. When the garden was more traditionally managed they were more of a problem, getting in all sorts of places but I never had any bother with them shading out the spring bulbs. That is such a shame for you. Yeah, the few hazelnuts that I get, the squirrels find faster than me, too. I actually went around and hand-pollinated most of the hazel bushes this winter, we’ll see if that helps. (I’m not sure, but I think the corkscrew hazel might be a sterile mutant, so I want to test that.) Mainly I want some nuts to grow new bushes from, since my attempt to propagate them with cuttings didn’t work at all. Supposedly, it’s easy, but mine never formed roots from the underground buds, they just got leaves above ground in the next spring and then died. We have the columbines popping up everywhere, too, but I don’t mind that. It’s just annoying that they spread so much in that one bed and overtook the plants that had been growing there before. It was a fairly densely covered bed, so I didn’t expect the columbines to self-seed that much. Especially since they never seem to want to grow where I put the seed by hand. Reblogged this on Lung Ta.